There are dozens of home remedies for poison ivy that can help heal and soothe the skin after a run-in with this troublesome plant. Here’s how to spot, avoid, and treat poison ivy. As you escape winter and head out into spring, it’s good to prepared for some of the nasty stuff that warmer weather might bring, like rashes, burns, and bugs. One of the biggest challenges of nature time is the green leafy fiend known as poison ivy. This pesky plant is common, and unfortunately causes a lot of itching and frustration each year. 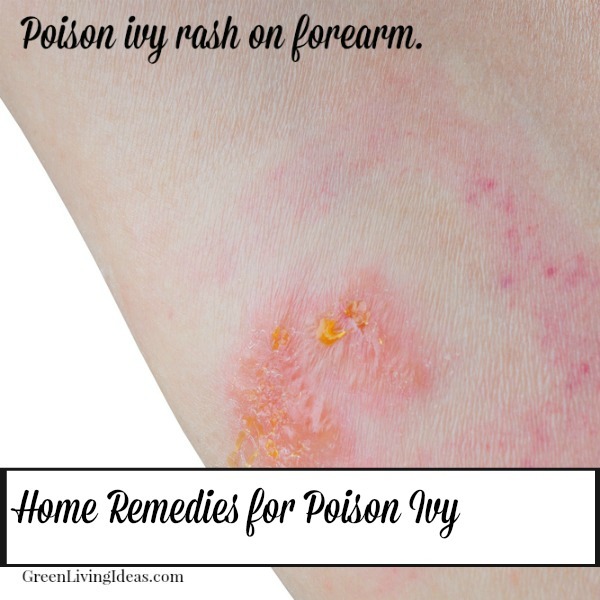 But it can be healed easily, and there’s no need to fear with our home remedies for poison ivy. With these home remedies under your belt, you’ll be ready to enjoy your summer to the fullest. Poison ivy is commonly thought of as a nasty weed, and for anyone that has suffered her burn, it is obvious why it’s classified as a ‘noxious weed’ in many states. It is a pretty, green, leafy plant that turns a gorgeous red color in the autumn. It is found throughout North America and Asia and contains a compound in the sap known as urushiol, which causes allergic skin reactions in about 70% of people. Poison ivy is found in many areas of deciduous forests and is present there throughout the spring, summer and into the autumn. It can cause an itchy, blistery rash anywhere on the body that can be very irritating, and in rare cases can cause anaphylaxis. Each group of three leaflets grows on its own stem, which connects to the main vine. You can see in this image that each leaf has a distinct notched pattern, too. Always keep your eyes open for poison ivy along trails, along edges of forests, and be sure to watch up and down, as it can be found at your feet or climbing trees at torso and shoulder level. The best way to avoid poison ivy is to learn to identify it, but also to prepared for treks into the forest with long-sleeved shirts and full-length pants. The sap can stick to clothing, so remove all forest clothing carefully and toss immediately into the washing machine. Soap and water will remove the oils from clothing. If you think you’ve touched the poison ivy, wash your hands as soon as possible with soap and warm water, and be careful to avoid touching your eyes, face and anywhere else on your body. If you’ve had a close encounter with poison ivy, your skin will be itchy, red, irritated, maybe even painful and blistered. Natural home remedies are safer and can be more effective than other over the counter treatments like calamine lotion, which studies have shown is ineffective for rashes and poison ivy. 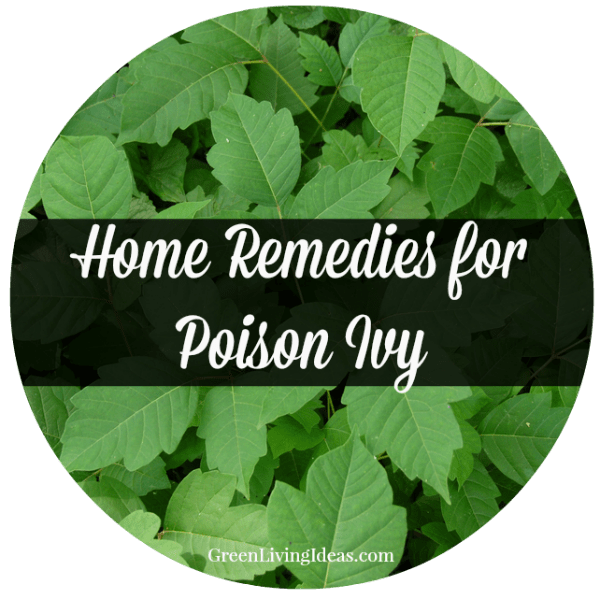 Home remedies for poison ivy include lots of good stuff from Nature’s medicine cabinet: essential oils, witch hazel, and natural healing balms to help you feel better quickly. There are two steps to natural healing for poison ivy: first, you need to dry out the blisters and rash. Once the skin has stopped blistering, you can begin the healing process. Baking soda: Is there anything that baking soda cannot do? Make a thick paste with the baking soda and apply to rashy area. This will help dry out the blisters and relieve the itch. Diatomaceous earth: Choose food-grade diatomaceous earth, mix into a paste and apply to affected area. This also helps dry out the blisters and promote healing. Salt water: If you don’t live near the ocean, make a salt water bath to help cleanse and dry out the skin. Witch Hazel: A natural alternative to rubbing alcohol, witch hazel is an astringent that’s great for cleansing and drying the blisters associated with poison ivy. Oatmeal: Grind up oatmeal and add to a warm bath. The oatmeal will help relieve the itching immediately. You can also make an oatmeal poultice to cover the affected area. Leave on for 15 minutes then wash off gently. Apple cider vinegar: a great healing agent all around. ACV works like an astringent. It might be slightly stinging when applied to skin, but will help clean out the urushiol oil and help dry out any blisters. We recommend Dr. Bragg’s unpasteurized apple cider vinegar for edible and topical uses. Jewelweed: This plant grows near poison ivy and has natural healing properties. You can crush the leaves and apply to a rash to help reduce itching. Tea tree essential oils: Tea tree essential oil is naturally anti-fungal, anti-bacterial and generally very healing. Use a cotton ball to dab the affected area after it has stopped oozing puss to boost the healing process. Lavender essential oil: calming, healing and relaxing, lavender oil is a great skin healing oil. Mix with a base oil or apply directly (test a small area for irritation first). It can help speed healing for skin conditions. Coconut oil: Coconut oil is good for almost all skin types, and promote rapid healing of damaged skin. Use the same oil you would use for cooking, and apply a few times a day to the affected area. Vitamin E Oil: Usually derived from pumpkin or sunflower seeds, vitamin E oil is super concentrated and is great for healing most skin conditions. I like to use this oil and night and let it soak into any damaged skin for quick healing. These natural home remedies for poison ivy are also good for lots of other summertime conditions too: sunburn, heat rash, scrapes and cuts. Build up your natural medicine cabinet for this summer and heal thyself well!